Singer / songwriter Alan O’Day, who recorded the #1 hit “Undercover Angel” (1977) and wrote Helen Reddy’s “Angie Baby” (#1 - 1974), “Train of Thought” (#27 - 1974) from Cher and the Righteous Brothers’ hit “Rock And Roll Heaven” (#3 - 1974), died of cancer at his Westwood, California home Friday (May 17). The Southern California native (though he also called Nashville home) was 72. He wrote over 100 songs for the animated “Muppet Babies” cartoon series as well as a song for Disney’s “The Little Mermaid.” All told, his songs were recorded by such varied artists as Olivia Newton-John, Anne Murray, Three Dog Night, Dave Mason, Johnny Mathis, the 5th Dimension, the Captain & Tenille, Tom Jones, Peggy Lee, John Travolta, Dusty Springfield, Bobby Sherman, David Clayton Thomas, Tony Orlando & Dawn, Paul Anka and Gene Pitney. One of his last projects was composing the theme song for the independent film, “You Don’t Say." Wow! No, I had not heard this. This one REALLY hits close to home. Alan and I had become pretty close friends over the past few years ... I even featured one of his tunes in last week's "Ain't" special ... and we had talked about doing a radio piece together, too. Over the years he has been a good friend to Forgotten Hits, sharing demos with us (like HIS version of "Angie Baby" and "Easy Evil", a song later covered by John Kay after leaving Steppenwolf) and many of the stories behind his songs. We've given away numerous autographed copies of his CD's and even "sneak-peeked" a couple of tracks before they were officially released to the public. Just recently he appeared on stage with Helen Reddy, helping her out with "Angie Baby" after Helen forgot a couple of the lyrics! And, as Ron stated above, his latest work appears in the film "You Don't Say". Sad to report Alan O’Day died Friday. No contest. Your set made me believe there is hope for radio. On the other hand, I kept moving on to the next song of your "instead of this" list before the intros were completed. Fun example for a Friday. Thanks for posting Ronnie's Snippets on Demand new website. I just spent some thirty minutes on it. I did get 29 in a row right before I quit. I tried it several other times as well. According to his instructions, I am eligible to be entered into his Genius Hall of Fame. Kent, a genius I am not about this music that we love. I try to think, however, that my knowledge is maybe a little bit above average. Incidentally, I picked the music of the early sixties to test. One final thing. In the past two weeks here in OKC, I have heard versions of HAND JIVE by Johnny Otis, QUIET VILLAGE by Martin Denny, LET THERE BE DRUMS by Sandy Nelson that I have never heard before on the radio. It was re-recordings by the artists themselves. In fact, the Sandy Nelson instrumental wasn't even a close second as to sounding like the original. In fact, it wasn't even in the ballpark. Also, while looking at Ronnie's website Snippets on Demand I noticed something that I did not know. Maybe you had this information in FH last month and I just missed it ... but apparently last month we lost Emilio Pericoli and Don Shirley. Emilio Pericoli had the 1962 song AD-DI-LA. Don Shirley had two songs here in the OKC area. His 1961 instrumental WATERBOY went to number one. I also enjoyed his followup DROWN IN MY OWN TEARS. P.S. I don't know this for a fact but I'm sure you will tell me, but someone told me years ago that WATERBOY went to number one also in Chicago. Ironically, I was just having a similar discussion with Bish Krywko, program director at WRLR about the necessity and importance of having good, clean original copies of the music they air ... they're actually reviewing their music library right now to insure that the music they're broadcasting is of the highest standards ... not always the easiest thing to accomplish when you stray from the "tried and trued" (aka "beaten to death") playlist and venture into some "uncharted" territory. Just announced ... another "Wrecking Crew" screening ... this time in Daytona Beach, Florida ... on June 10th ... at the Paragon Oceanwalk 10 Theater ... 250 N. Atlantic Ave. Producer / Director Denny Tedesco will be on hand for a brief Q & A after the show. On Sunday, June 9, 2013, the day before the screening, hippies of all ages will descend on Daytona's Peabody Auditorium once more to celebrate peace, love and happiness. This annual summertime event has grown to become one of the Peabody's most popular shows -- indoors and out. I will have a booth. Please come and say hello. If you are in the Orlando / Daytona area and you want to sponsor seats, please look below for details and click to see how we've highlighted our past sponsors at screenings. This is how we've been financing travel to various cities. We still have room for additional sponsors for the Daytona Beach screening. Email Denny at denny@wreckingcrewfilm.com for details. I do know of one Kingston Trio recording that was almost prevented from making it to the airwaves ... "Greenback Dollar". The song was the first cut of their "New Frontier" album. When it was decided to release the song as a single, the nervous record execs interrupted the trio's tour, and made them come in to the studio, to record ONE guitar chord. The chord was then inserted into the song, in place of that terrible word "damn". Of course, fans who wanted to hear that "word" would have to buy the album. 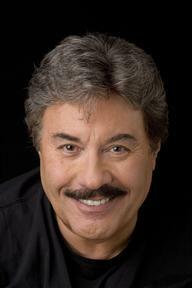 Greetings again from hot and sunny Laughlin, Nevada, where Tony Orlando appeared over Mother's Day Weekend. His nearly sold-out show on Saturday night was his first in the two year-old E-CENTER at the Edgewater Hotel, with over 2,500 in attendance. The best word to describe Tony's current show is ... eclectic. Tony really is a wild and crazy guy and his show is a zany musical romp! I've seen Tony perform in Laughlin twice before (at Harrah's Hotel's outdoor amphitheater) and he gets a little crazier with each show. He opened the show with his own version of the Neil Diamond hit "America" as a tribute to veterans from WW2 up to Afghanistan. He asked each different group of vets to stand and be recognized and then sang a verse of the song with lyrics changed to be about them. Kind of a strange way to begin a set, in my opinion. (I felt it could have been more effective placed later in the set.) Still, it was a very nice gesture and well-received by the audience, even if they weren't prepared for an extended patriotic segment at the beginning of the concert. From there the show was a wild ride! Of course Tony performed his hits, and it was amusing when he showed great relief and satisfaction that the audience "still remember" the 40 year old songs. I have to admit that I never thought of Tony as a stellar vocalist in the same league as the more legendary pop singers of the fifties, sixties and seventies. With all due (and deserved) respect, Tony's renditions of his and other classic hits were not all that memorable. But, that being said, what Tony may lack as a vocalist, he MORE than compensates with his skills as an overall entertainer. The two-hour show (long by casino-hotel standards) went by very quickly, while still leaving the audience fully satisfied. The concert was energetic and tons of fun. Tony truly connected with the audience throughout and kept everyone in great spirits with his jokes and self-effacing shticks. 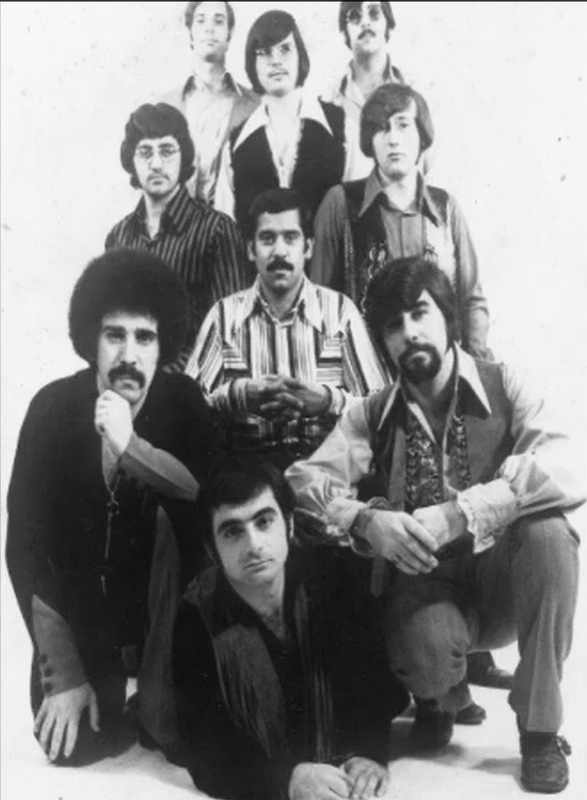 For me, the best parts of THE TONY ORLANDO REVUE were the routines with Tony and the different individual members of his band. These guys (and one lady, songwriter Toni Wine) are great artists and performers in their own right and Tony makes full use of their individual talents. There were excellent performances from them all, which included great impersonations of classic rock and country superstars performing legendary hits and terrific instrumental routines. At one point, Tony encouraged his drummer to begin beating on the legs of a stool while leading the musician around the stage like a lion-tamer! This ten-minute long routines ended with an extended drum solo ... played on the floor of the stage! Toni Wine was introduced by Tony and asked to sing a verse from her classic pop song GROOVY KIND OF LOVE, which turned out to be a very heartwarming and emotional moment. A real nice touch ... until a huge dragonfly that had made it's way into the venue landed on Toni's shoulder, giving her a momentary scare! All in all, it was a very enjoyable couple of hours last Saturday night and I highly recommend seeing this rollicking "revue" if it passes through your area! I was hoping to record and share a few video highlights, but video recording was not allowed at this performance and I'm not about to disrespect the artist's or management's requests. But I am sure you can find videos of Tony's recent performances online. This weekend features a double bill of Joan Jett and Steve Miller at the newly-erected Laughlin Amphitheater ... I can't wait to see Saturday night's show! COLLECTIVE SOUL appears at Edgewater's E-Center Memorial Day Weekend and the weekends that follow will see a couple of great classic rock headliners. FOREIGNER comes performs at the Riverside Hotel's outdoor roof-top amphitheater on Saturday, June 1 and on Saturday, June 8, REO SPEEDWAGON will be rockin' the river at the E-Center. LATE BREAKING NEWS: Just added to the summer lineup of visiting acts is an appearance by THE SPINNERS at the E-Center on Saturday, August 3. Here on the river, the hits just keep on comin! Stand by for more in the weeks and months to come. The other day we told you about Endless Summer Quarterly publishing their 100th issue. Well David Beard has some of those classic covers to share, posted up on his Examiner web page this morning ... along with more on the evolution of what is most certainly the #1 Beach Boys / Brian Wilson magazine in the world. I've just put up the latest version of Snippets On Demand! I hope that you will share this with your readers, many of whom privately made the suggestion that I add a public "high score" page to my game. I am happy to report that I have done that. I've just incorporated the Snippet Genius Hall Of Fame. I've created the Snippet Genius Hall Of Fame. The mythical building is located in the city of Oldiesville! The page is available for all to see, even though there are no inductees yet as I type this. But I have a feeling that situation will change mighty quickly. This Hall Of Fame is for PERFECT SCORES only. The time to solve each snippet has no bearing on the Hall Of Fame. You can take the full ten seconds to solve each one if you'd like. Perfection is the key here.Let's say that you rattle off 75 snippets in a row. Of course, you could quit at that point and accept a PERFECT 75 and you would then AUTOMATICALLY QUALIFY TO BE AN INDUCTEE. But if you're greedy, you might decide to try for 76. If you do that and you miss, you LOSE your perfect score and that game will not be eligible for Hall Of Fame listing. If you get a Perfect 10, you will still be a Snippet Genius. But, to use a baseball analogy, you would be like an ALL-STAR. In order to qualify for the Snippet Genius Hall Of Fame, you will need MORE. Many ballplayers who are frequently elected to the annual All-Star game do not make it to the Hall Of Fame. If you end your game with a perfect score of 20 or more, you will be verbally told that you have earned your way into the Hall Of Fame and will then see some very simple onscreen instructions. Simply follow these instructions and you'll be on your way to The Snippets Genius Hall Of Fame. Your fifteen minutes (or more) of fame awaits you! I've heard personally from many of your readers. I hope that those who have played it will continue to do so and that some newcomers will try it out as well. Thanks for you help and nice comments Kent! 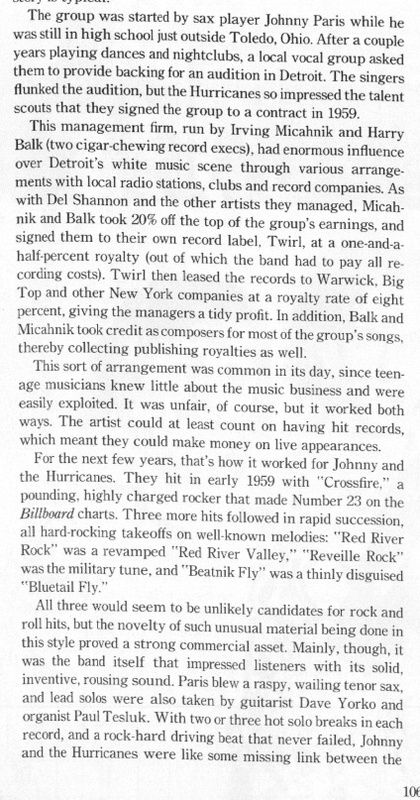 Found an interesting section on Johnny Paris (Johnny & The Hurricanes-Tension) in the 1976 Rolling Stone 'History Of Rock & Roll' book. 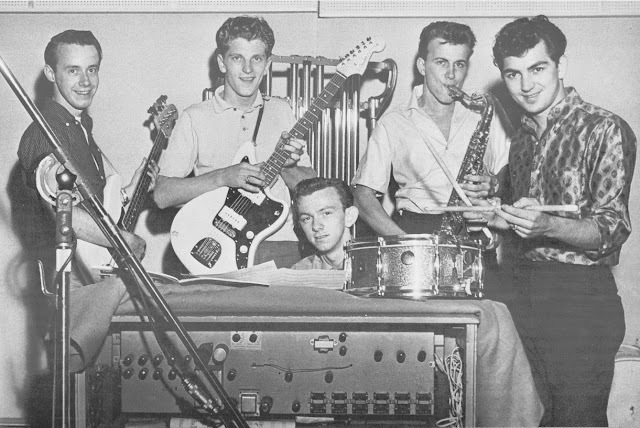 Turns out Johnny & The Hurricanes had an interesting history and were a favorite on the Beatles! During a 3-week engagement in Germany in 1961, the Beatles actually opened the show for the Hurricanes, who were the headline act at the Star Club! 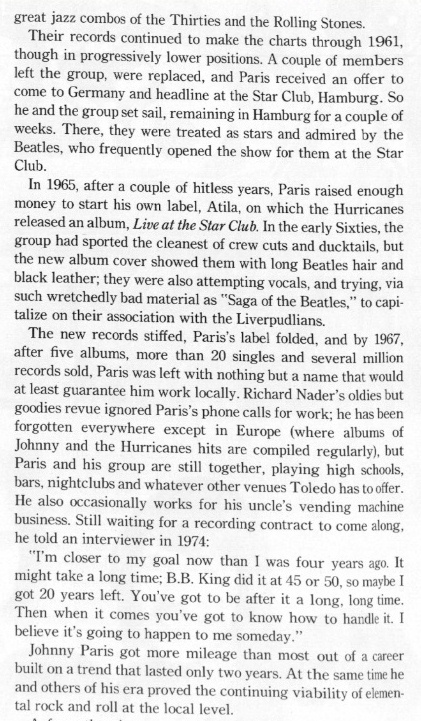 It shows how fame is so fleeting that Johnny Paris (Tension) were doing High School dances in CT. in 1971, performing his local hit "Does Anybody Really Know What Time It Is", while a decade earlier, the Beatles were HIS opening act!!! You probably had this song listed even though it didn't make your cut but it did quite well here in OKC as opposed to what it did on the national level and I am talking about the Byrds' 1968 song YOU AIN'T GOING NOWHERE. The other day, the novelty song "Transfusion" by Nervous Norvus (aka Jimmy Drake) came up in conversation. My oldest brother had the 45, and we were always singing the funny lines from it. I think I knew this, but I read recently that the song was actually banned from some radio stations' playlists. Wow ... very mild, compared to the garbage that's out there today. I was wondering if your readers could come up with more pop songs that were banished from the airwaves, and maybe you could put together a list of the most popular ones. What do you think? To repeat, this is it! The last Arrows’ album you can hold in your hands. 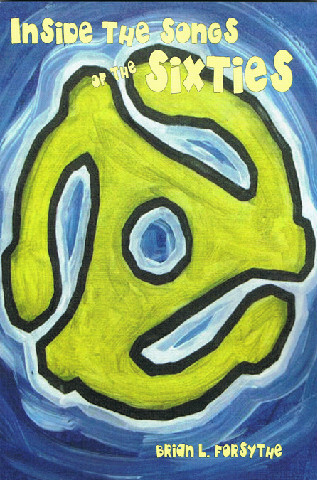 It’ll only be download albums after this final volume of my Retrophonic series. The first download album is the re-release of Restless In L.A. with the original cover idea. Just a few words about some of the tunes: “Los Cabos” ties the series together with an instrumental version. “War Path” celebrates the 50th anniversary of my first record and it’s only the first remake. Since the Arrows’ instrumentals have always been more popular with my fans, I’ve put together a whole album’s worth (16 tunes) followed by 9 vocals. Even the vocals should be a bit interesting with titles like “Shape of Things to Come”, “(Ghost) Riders in the Sky”, “The Glory Stompers” plus two Buddy Holly tributes: “Think It Over” and “Oh Buddy, We Miss You So” (if you have volume 2 of this series, please note that this version is in a different key, it has some lyric changes and I re-did the entire vocal). I'm only charging $10 and that includes the postage and bubble mailer. But wait, there's more: a new mailing label, an autograph and a lyric sheet (oh well, it seemed funny when I thought of it!). You can also use Paypal. Beggars Banquet, Let It Bleed and Hot Rocks 1964-1971, the most celebrated albums in ABKCO's catalog of Rolling Stones releases, will debut later this month as 180-gram LPs, pressed on clear vinyl, in celebration of the band's 50th anniversary and '50 and Counting' tour. 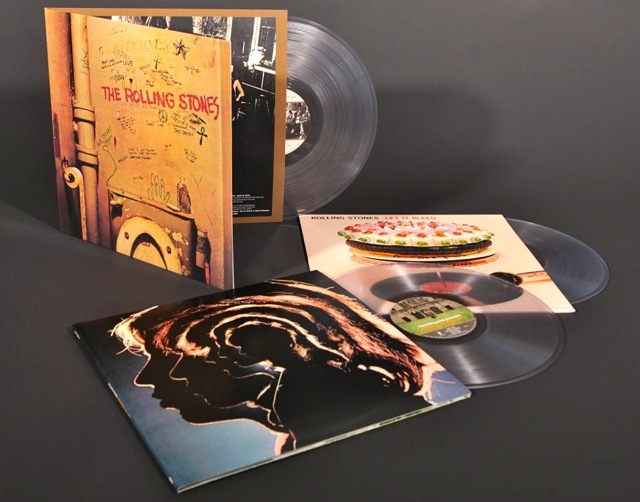 The launch of a projected series titled "The Rolling Stones Clearly Classic," featuring these three initial releases out May 28th, focus on the three Rolling Stones albums that reflect the group's formative years and transformation into "The World's Greatest Rock and Roll Band" at the end of the 1960's and into the early 70's. All three albums have been meticulously mastered from high resolution audio files sourced from the original master tapes, assuring optimal sound quality that exceeds both conventional CD audio and digital downloads. Beggars Banquet was a breakthrough album for the Rolling Stones, recorded in 1968 in London and Los Angeles and produced by Jimmy Miller. It was the last full album with founding member Brian Jones in the line-up and includes such classics as "Sympathy For the Devil," (the subject of the Jean Luc Godard film of the same title), "Street Fighting Man," and "Factory Girl." Guest musicians and vocalists on the album include Nicky Hopkins, Rocky Dijon, Ric Grech, Dave Mason and The Watts Street Gospel Choir. Let It Bleed, the first Rolling Stones album that includes contributions from Mick Taylor who replaced Brian Jones shortly before the latter's death, is the stuff of legends with many considering the set as the band's very best. It includes "You Got The Silver," featuring Keith Richards' first lead vocal, "Midnight Rambler," the apocalyptic themed "Gimme Shelter," the band's faithful take on Robert Johnson's country blues "Love In Vain" as well as the epochal "You Can't Always Get What You Want." Guests include Ian Stewart, Nicky Hopkins, Jack Nitzsche, Ry Cooder, Leon Russell, Al Kooper, Bobby Keys, Byron Berline, Rocky Dijon, Merry Clayton, Madeline Bell, Doris Troy, Nanette News and The London Bach Choir. Hot Rocks 1964-1971 is a collection, on 2 LPs, of tracks that, in essence, launched the band into the public consciousness with a run of hits that went on to establish the Rolling Stones' preeminence on both sides of the Atlantic. A total of 21 songs, recorded over 7 years, on four sides, including "Time Is On My Side," "(I Can't Get No) Satisfaction, ""Get Off My Cloud," "19th Nervous Breakdown," "Let's Spend The Night Together," "Jumpin' Jack Flash, "Sympathy For the Devil," "Midnight Rambler," "You Can't Always Get What You Want," "Brown Sugar," Wild Horses" and more, are featured. Originally released in December 1971, the album remained on the Billboard album chart for 243 consecutive weeks and was certified 12 times Platinum by the RIAA. The collection includes 11 Top 10 US and UK hits and 7 hit singles that reached #1. Hot Rocks 1964-1971 is, by any measure, one of the greatest of all greatest hits albums ever released. It does seem a little odd the soundtrack album used someone else's version, but it's not the first time. Maybe the composer Edwin Ashley had his own recording contract like Henry Mancini did. Mancini's albums almost never had the same singers as on the movie track. I am a little bit disappointed in you. To me the ultimate "ain't" song has got to be from 1960, Buster Brown's followup to FANNIE MAE, IS YOU IS OR IS YOU AIN'T MY BABY? To me, that had to be the number one song with every teacher who taught English in school at the time. The other songs would be ... ill-fitted if we removed the "ain't" from them, but "He Ain't Heavy, He's My Brother" would lose all its boyish, brotherly charm if changed. The original Boy's Town story of "He ain't heavy, Father, he's my(me?) brother." flourishes within this expression of true caring and love. One of my favorites. To announce its new dictionary, the G. and C. Merriam Co. sent out a press release saying Webster’s Third had finally welcomed ain’t into a dictionary and was endorsing its use. This was inaccurate on both counts, but newspapers lapped up the news that, in the words of the Chicago Tribune, “the word ‘ain’t’ ain’t a grammatical mistake anymore.” The Toronto Globe and Mail, however, was not laughing. It said in an editorial, “A dictionary’s embrace of the word ain’t will comfort the ignorant, confer approval upon the mediocre, and subtly imply that proper English is the tool only of the snob.” Even worse, said the newspaper, speaking in the midst of the early Cold War, a bad dictionary could help undermine communications with the Russians and thus bring about a nuclear apocalypse. Author Brian L. Forsythe sent us a couple of signed copies of his new book "Inside The Songs Of The Sixties" to give away to our readers. If you're interested, drop me a line and we'll pick two winners. 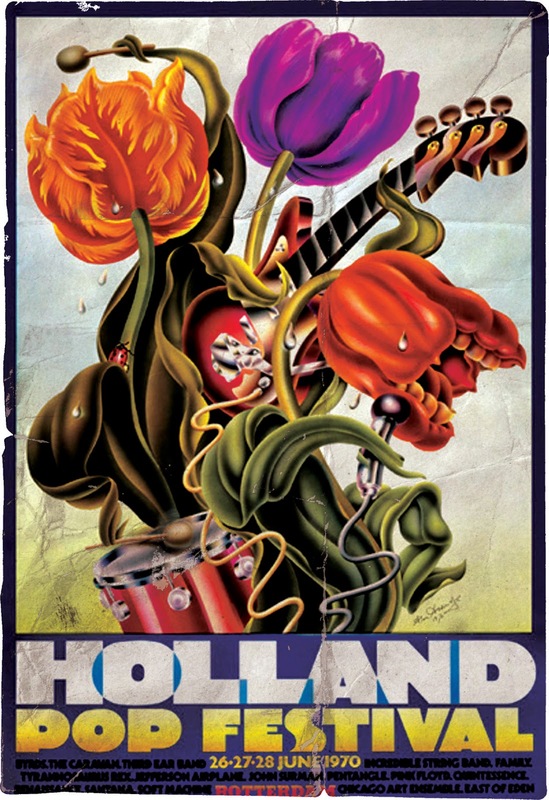 Congratulations to David Beard, whose "Endless Summer Quarterly" celebrates its 100th Issue with a look back at The Beach Boys' "Holland" LP. And, speaking of The Beach Boys, sounds like a great new DVD release is right around the corner. It captures all three Wilson Brothers, Mike Love and Al Jardine during the "comeback years" ... and I remember watching this one before ages ago. Filmed in 1976 at Anaheim Stadium for American television, Good Vibrations follows the release of their 15 Big Ones album. Combining full live performances with interviews and several whimsical vignettes, Good Vibrations is 50 minutes of Beach Boys faire at its finest. This DVD features all the original band members (Brian, Carl, and Dennis Wilson, Mike Love, and Al Jardine) performing their timeless classic hits: “Good Vibrations,” “God Only Knows,” “I Get Around,” “Fun, Fun, Fun,” “Sloop John B,” “California Girls,” “Help Me Rhonda,” “Surfin’ USA,” and many more. From the three Wilson brothers performing a song about their father to the full band harmonizing with a gospel choir, this DVD is packed with incredible moments. The Beach Boys were the most successful American pop group of the sixties. Their legendary vocal harmonies, renowned anthems, and classic albums earned an induction into the Rock ‘N’ Roll Hall Of Fame, and to this day, this music inspires fans, musicians, and songwriters of all generations. Above all, Good Vibrations is a perfect snapsnot of why The Beach Boys are one of the most endearing and beloved music acts of all time. 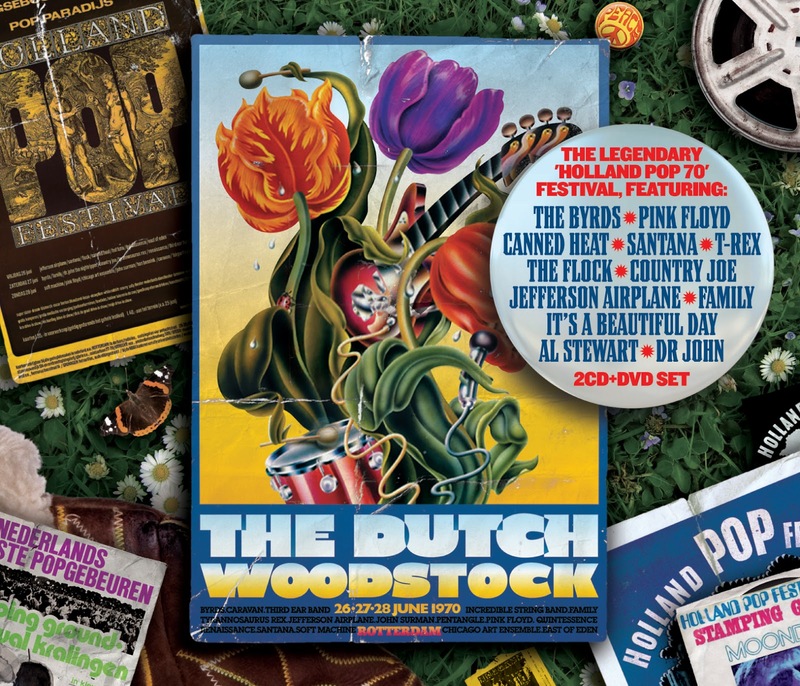 London, UK - One of the most historic concert events of the early '70s, the Dutch Woodstock, also called the 'Holland Pop Festival', has now been released on a double CD/DVD set by UK's Gonzo MultiMedia. 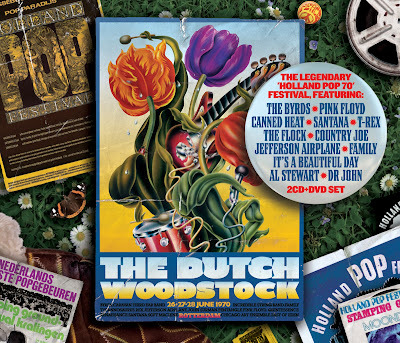 Featuring rare and exciting performances by Pink Floyd, Santana, T.Rex, The Byrds, Canned Heat, Jefferson Airplane, Soft Machine, It's A Beautiful Day, Family, Country Joe, Dr. John & The Night Trippers, Flock and Al Stewart, makes this extraordinary release a must for fans of music everywhere! 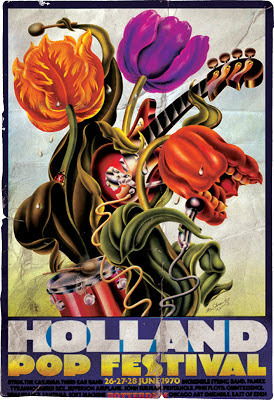 The three-day festival was held in August 1970 at the Kralingse Bos (Kralingse Forest) in Rotterdam, and despite the rain, an estimated 100,000 people attended the astounding event! Ain't It The Truth? Ain't It The Truth?